Ed. Note: This is a “Tales of Triumph” tale, if there ever was one. Make sure you have Kleenex on stand-by to dry your tears. I am writing this letter because I want everyone everywhere to be aware of some really special Chicago police officers and how they truly changed the lives of my three young grandchildren. Because of these officers they now have a chance in life. 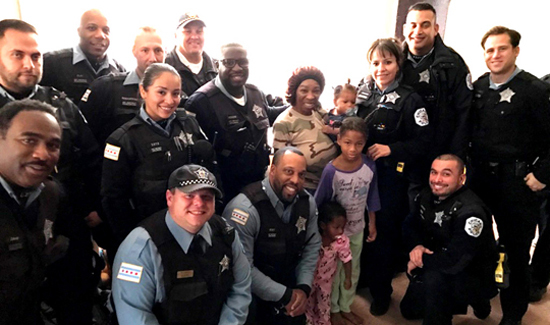 Last November officers from the Chicago Police Department’s 007th District responded to a call about young children who had been left alone. Once they arrived on the scene they discovered three girls, Destiny, 7; Dericka, 2, and Erica, 1, inside an abandoned house. They were all alone. The house had no electricity, no heat and was in an uninhabitable state. The officers summoned EMS and the girls were transported to the hospital for evaluation. Destiny was able to help the officers contact me, their grandmother. Sgt. Charles Artz and Officer Michael Cleary told me about the horrible living conditions they were found in. Destiny showed signs of physical abuse done at the hands of their father, my son. I had no idea about how the girls were living and the abuse they had been exposed to. Soon after arriving at the hospital I was put in touch with a DCFS investigator. After some initial screening I was allowed to take the girls home with me. Because of agreeing to take care of my granddaughters, I wasn’t able to maintain employment. I consider it a miracle that these officers were able to find the girls and reunite them with me and what happened next was beyond miraculous. It started with Officer Cleary and Sergeant Artz bringing me diapers and milk, which they purchased on their own. Officer Cleary and Sgt. Artz shared the story with their fellow officers, and in the days that followed, more and more officers started coming to my house with donations of clothing, furniture, gift cards, and whatever else I needed. The Community Policing Division officers set aside winter coats for the girls during their annual coat give-a-way when they learned that I had no way to get to the event. 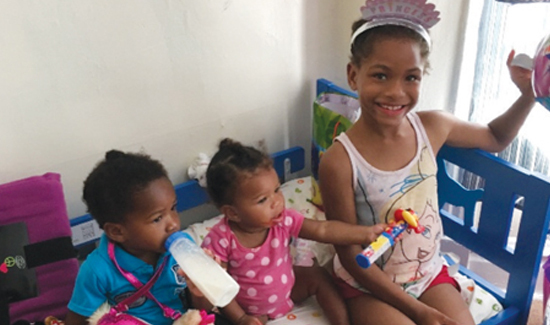 When the officers discovered that Dericka and Erica shared a birthday, they showed up at the house for an impromptu birthday party with balloons, cake, ice cream, and presents. As far as I know, it was the first birthday party the girls ever had. One officer in particular, Officer Myrian Bugarin, has become exceptionally close with Destiny, helping her make the transition of starting school which Destiny had never attended in her life. Officer Janice Wilson, along with Officer Bugarin, have babysat for the girls at times when I had other obligations or just to be with the girls and offer me a break. Officer Bugarin also has been one of the ones that donated items from her own home to assist me. If all this wasn’t enough, I learned that Sergeant Artz, Officers Cleary and Bugarin, and their supervisor, Lt. Eve Gushes, on their own time, started a Go Fund Me campaign (The Englewood Angels), along with an Amazon Wish List (started by Officer Bugarin and Lt. Gushes) to assist me with money and items I need for my home. The support I have received has been overwhelming. The Go Fund Me campaign that the officers started for me generated over $125,000 from donations, I am told, from all over the world. Hundreds of packages have also been sent that include items for my home to help me once I settle in. The officers have put me in touch with financial advisors so I can properly secure an educational future for my grandchildren, along with helping me to locate a larger place to live and making sure I have enough money to properly care for them as well. Besides the money that was donated, many members of the community offered services and took the girls on outings to expose them to things they would never had the chance to experience. We were taken to Brookfield Zoo to enjoy the holiday lights show. We discovered that Destiny did not know who Santa Claus was until it was explained to her. On another outing, because of a generous donor, we got to ride in a limousine to downtown, where we went to Macy’s for lunch and a shopping experience. These are things the girls would have never had the opportunity to experience if it wasn’t for these officers. Officer Renee Beamon would also come over and babysit when needed, as well as style the girls’ hair, so they would look absolutely beautiful when going out on any of the outings. Because of these officers, I was put in touch with a former employer who, once I get things settled, has offered me employment. There has also been an offer from someone who is willing to purchase a home for us. The officers also hosted a birthday party for Destiny’s eighth birthday, the first birthday party she’s ever had. I cannot say enough how truly blessed I am because of what these officers did. Officer Cleary, Officer Bugarin, Sergeant Artz, and Lieutenant Gushes are the angels sent to me from above. Without a doubt they saved my granddaughters lives and changed my life forever. They have saved them physically, emotionally, and have given them a chance in life. Because of their actions, they have secured an educational future for the girls from the money that has been donated. No matter what happens to me or the girls, whether they are returned to their parents or not, the girls will always have the means for an education. These officers need to be honored. They have gone way above and beyond the call of their duty. In a time where relationships between the community and the police are strained, these officers have proven that there are police officers dedicated to their job, and dedicated to making a positive difference in the community they serve. These officers also have done all of these remarkable things while off duty on their own time, taking time away from their own families. While I understand that many more officers were involved in helping me and my granddaughters, the five I must single out are Lt. Eve Gushes, Sgt. Charles Artz, Officer Michael Cleary, Officer Myrian Bugarin, and Officer Janice Wilson.